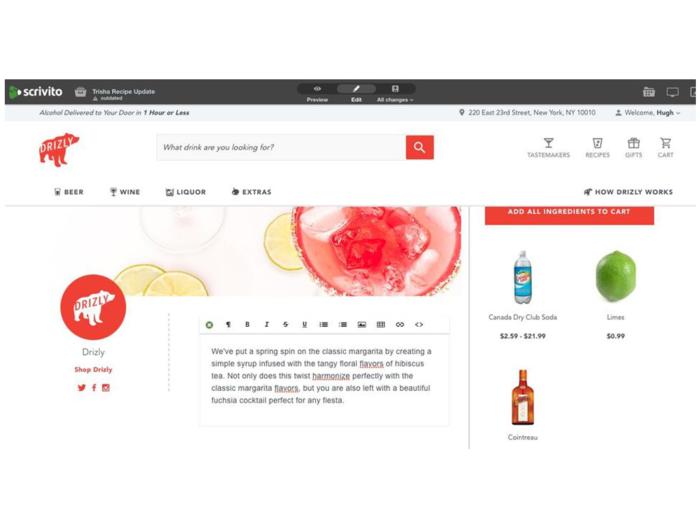 Drizly is an American online shopping platform for alcoholic beverages. With their smartphone, users can order from a wide selection of beer, wine, liquors and other beverages. A local stores handles the delivery. Founded in 2012, in the meantime, the website services numerous cities in the US and Canada. The initial Drizly e-commerce application was already conceived with Ruby on Rails, but Drizly needed a future-oriented CMS solution to be able to grow flexibly. The Infopark team helped Drizly to include the Scrivito Cloud CMS content management system into the running product environment. The widget concept supports Drizly with optimal content management on the product level. The website editors can easily generate content in the CMS - for example, landing pages for cocktail recipes - and then simply link them to the relevant products in the e-commerce application. Customers then quickly find the beverages and ingredients they need and with a mouse click can put them in their shopping carts. Drizly is based on a complex e-commerce application that allows customers to find local dealers, compare prices from local dealers and order goods that they can either pick up themselves or have delivered. Additional content like recipes and detailed product descriptions offer added value, but the content has to be appropriately managed. The Infopark consulting team supported the Drizly staff on-site in implementing the Scrivito CMS as the new content management system. WIth Scrivito, Drizly can reproduce all the content marketing aspects in one application - and continue to grow.